Nine-week-old kitten Diesel is lucky to be alive after he was found trapped in a car engine. Fortunately, a good samaritan rescued Diesel and took him straight to an emergency vet, who contacted the Home to collect him. 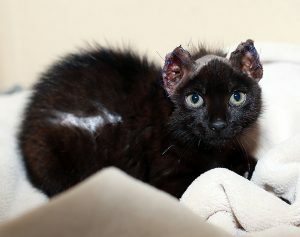 “Diesel was suffering from burns to his little body and paws, and injuries to the tips of his ears,” said Amanda, cattery coordinator at the Home. Diesel recovered under the watchful eye of cattery attendants and the vets and vet nurses at the Home’s shelter hospital. Though he still shows some scars, his burns healed well. Unfortunately though, it was not possible to fix the injury to the tips of his ears, so our shelter medicine team performed surgery to remove the tips. It’s not expected that Diesel will have any further issues with his ears. 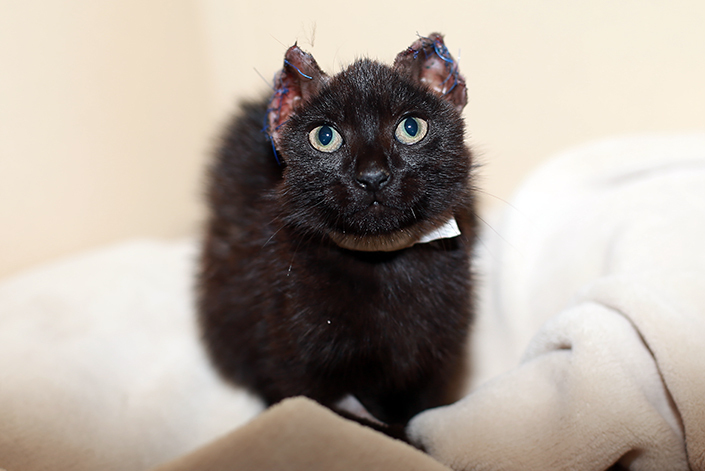 Despite his ordeal, Diesel is a very happy and bubbly kitten. He was not microchipped and nobody came forward for him, so he is now looking for a loving new home. Diesel is one of around 60 cats and kittens currently up for adoption at our North Melbourne shelter. They would love nothing more than to spend the festive season – and the rest of their lives – in caring forever homes,” said Amanda. “Diesel is an outgoing little kitten who enjoys playing games with people. Learn more about Diesel (animal ID 1022069) and our other adoptable cats and kittens here. Or, why not come and meet them at our North Melbourne shelter? They’re waiting for you!